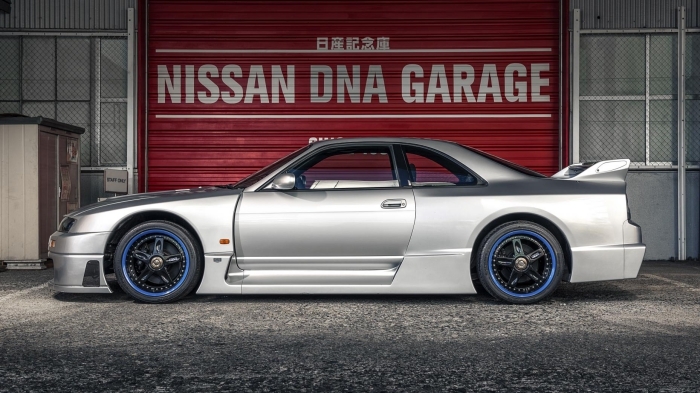 There are a few notably rare Nissan Skylines; the Z-tune, R400 and of course Brian O’Conner’s electric blue R34 from 2 Fast 2 Furious. 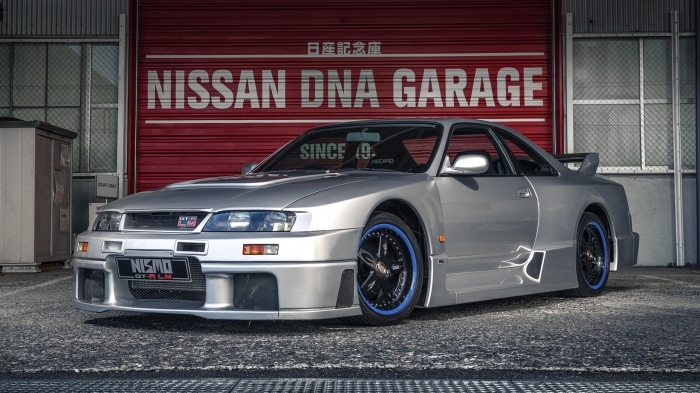 But there’s only one truly rare-as-unicorn-plop Godzilla: the awesome R33 LM. Fans of Gran Turismo may recognise the silhouette of this squat, wide-arched R33 from the intro movie of the original game. 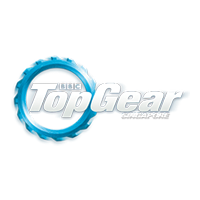 It’s a car that’s been replicated in every episode of the racing franchise since. But where multiple copies can live within the fantastical world of pixels, there’s only one hard copy in existence. 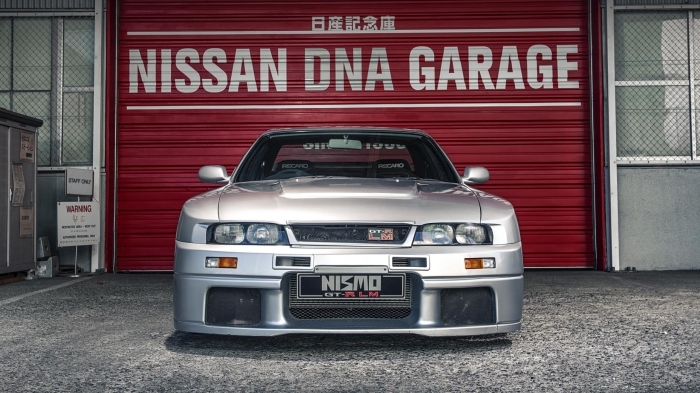 It’s housed in Nissan’s incredible Zama DNA garage. A meticulously tinkered toy box chock-full of the Japanese manufacturer’s back catalogue. It was also our location for a quick one-on-one meeting with the LM. We begged and begged to drive it, but that was out the question. Even Carlos Ghosn – chairman, president, CEO and the biggest of Nissan big wigs – has never been allowed to get behind the wheel. Still, that didn’t stop us begging, bribing and contemplating stealing it in order to see what it’s like to drive without a PlayStation controller. 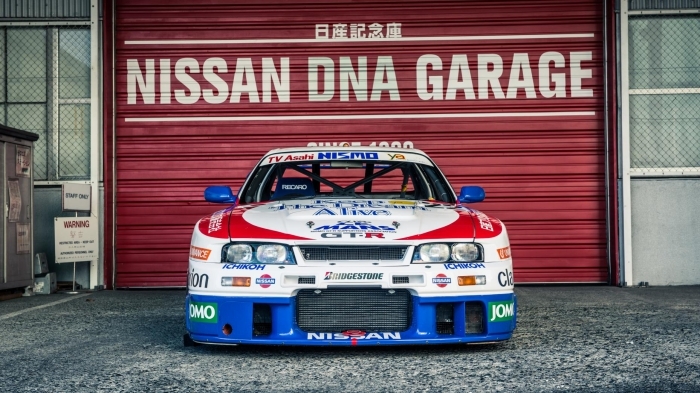 The R33 LM’s existence is the result of the changing state of endurance racing in the early nineties. Nissan tackled endurance racing with two feet during the late eighties, with a flurry of big-winged, high-downforce prototypes. They included the R87E, R88C and R89CK. Meanwhile, the icing on the cake was the R90Ck driven by Mark Blundell that set a pole-worthy quali lap at the 1990 Le Mans 24 Hours. However a rewriting of the rulebook in the early Nineties took a scythe to Nissan’s Group C programmes and made the cars all but obsolete by 1994. Where most other manufacturers decided to pull out and save a bit of cash, Nissan went back to the drawing board and began developing a brand new car with its go-faster arm, Nismo. New regulations all but abolished prototype racers, instead favouring production-based GT cars. With this in mind, Nissan decided to base its new ‘GT1’ racing car on the latest generation of the all-conquering Skyline GT-R. The legendary R32 Calsonic Skyline vanquished all its competition, winning 29 races from 29 starts across four seasons – a feat that gave it the name ‘Godzilla’. 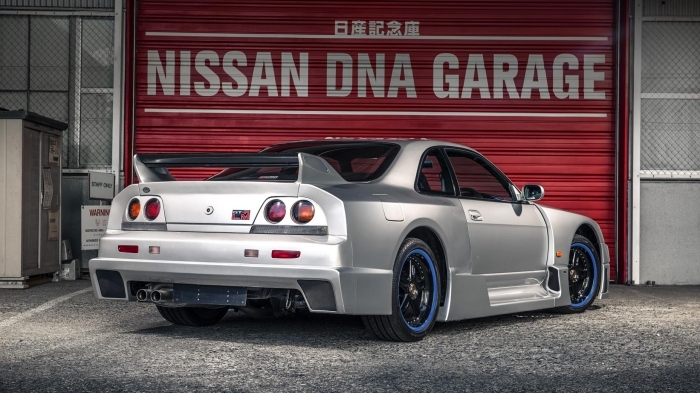 For the next chapter, Nissan would take its R33 successor racing. 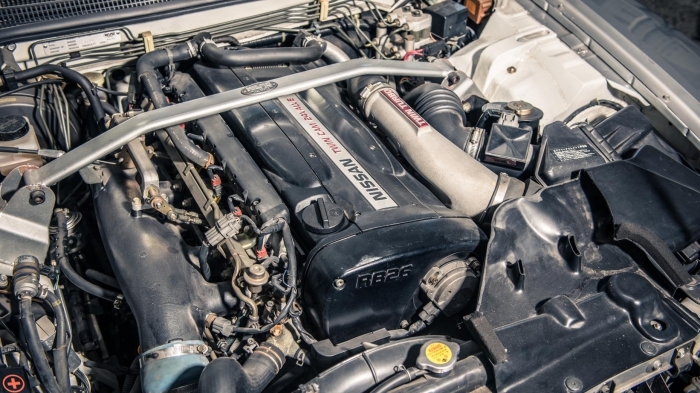 The R33 LM race car was stripped to 1150kg, had its front drive shafts pilfered to make it rear-wheel-drive and the legendary RB26DETT engine tuned to Group N spec, aka 400bhp. It also had a seriously bloated body kit to improve aerodynamics, cooling and grip. But before Nissan could take the R33 LM to Le Mans in 1995, it had to be homologated. For that to happen, one, and only one, road-going version had to be made. The result of which is the puffy-cheeked silver thing above. 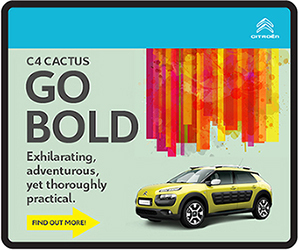 Registered to the UK, the road-going LM rarely moves. It’s looked after by many men in white gloves and held prisoner in the DNA garage. In person, the R33 has more presence and aggression than you’d imagine. The arches are a monstrous 50mm wider at all corners than the standard car, and it has a gaping gob, lowered chin and scalloped bonnet vents that all ramp up the drama. 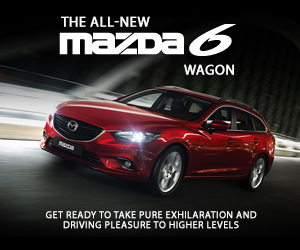 But with a jacked-up ride height and those tiddly black-with-blue pinstripe wheels failing to fill the bulbous, boxy arches, it’s also slightly incongruous. 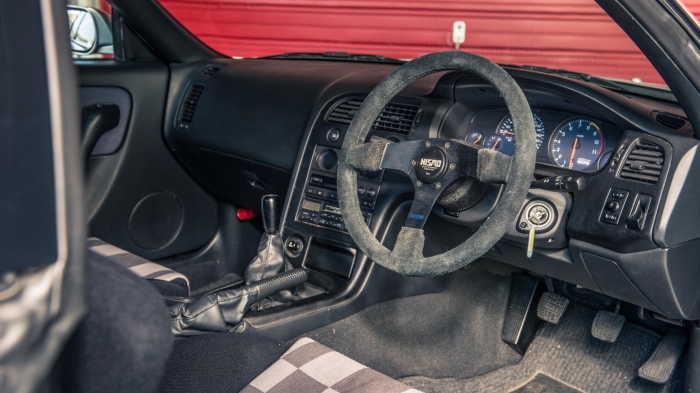 Homologation sorted, two R33 LM race cars invaded France in 1995 to try and win Le Mans. But against goliaths like the McLaren F1 and Ferrari F40, the GT-R struggled. The number 22 car qualified 34th and finished the race in tenth overall and fifth in class, behind four McLarens. The slightly faster number 23 car retired with gearbox damage after 157 laps. Despite returning with a more powerful and competitive R33 in 1996, the GT1 program was pulled a year early because of the punishing pace of the Porsche 911 GT1. 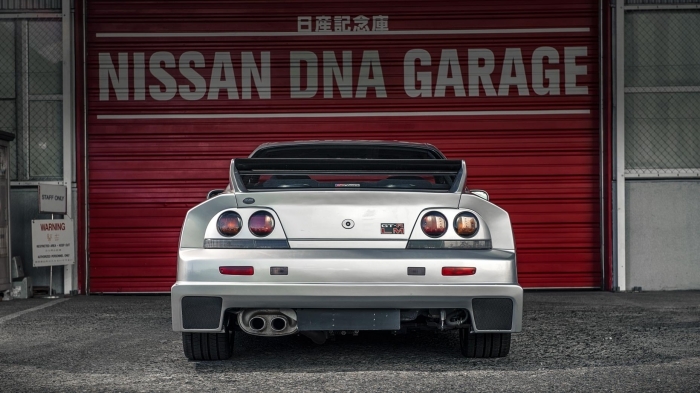 Even so, the Nissan GT-R Skyline R33 LM road car is a sacred jewel in the crown that is Nissan’s motorsport heritage. It’s a wide-bodied brute that’s too precious to be allowed to run free. But, as you can see here, it’s not the only one.